Aerates instantly to release bouquet to enhance flavor with a drip-free pour. Filters out cork residue, sediment, and tartrates. 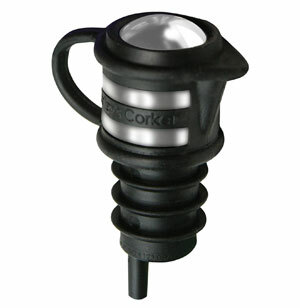 Prolongs the life of sparkling wine, champagne, craft beer and more. Easily fits all natural and plastic corked wines. and balsamic vinegar to prevent evaporation. Soft to the touch. Pliable and easy to manipulate. Does not absorb or alter aroma/flavor of contents. Allows for leak-proof side storage. Made of superior, medical-grade plastic.